How long were Noah and his family on the Ark? Where did the Ark finally land? These are questions that most kids can't answer. Kids usually know that Noah built the Ark...but the other facts tend to escape them. But it's the DETAILS that bring the Bible to life. Over the years, we've come to realize that most kids have big gaps in their knowledge when it comes to important Bible Stories. That’s WHY we designed our Bible Story Fact File Printables. These “one page wonders” were designed to complement just about any Bible lesson you’re currently teaching. 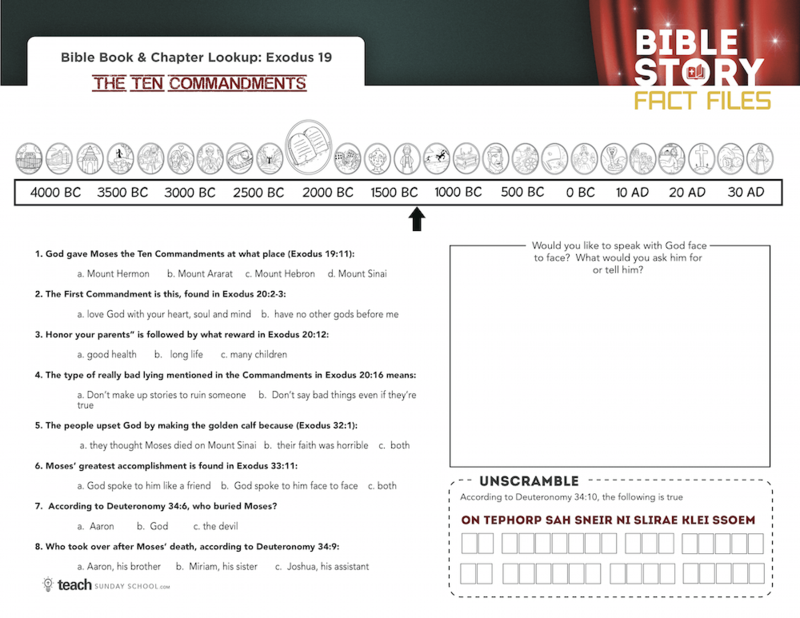 Each one-page worksheet does a “deep dive” into a classic Bible story. Each "Fact Files" challenges kids to use their Bibles to look up key verses to find the answers to various questions. Students will discover the who-what-when-where-why of each story, so they will know both the details and the overview. On each page, kids are asked to look-up answers to 7-9 questions in their Bibles. A timeline appears at the top of each “Fact File” which helps give kids an big picture understanding of time & place for each Bible story. Each puzzle will reveal an important element of the particular Bible story being studied. We provide a variety of exercises in thinking, memorizing, or illustrating in this area to keep things fresh. Inside you will find 25 Bible Story Fact File Printables- just like the one above! You can print off as many copies as you need for your own church or private use. 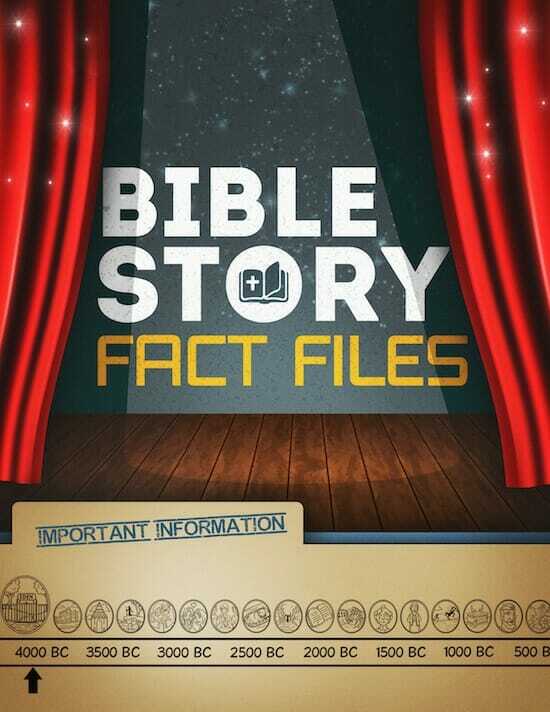 Each "Fact File" focuses on a beloved Bible story; we've included all the favorites from Creation to Revelation! In addition to the Fact Files, we've included two games your kids can play with the fact file printables as a way to extend the fun! And don’t worry- we provide a handy answer key to make it easy to verify correct answers! As soon as your order is securely processed, we’ll direct you to a download area, where you can get instant access to all 25 Bible Story Fact Files Printables. Print out the Fact Files, games, and answer key on your home computer in just minutes! Kids (& even grown ups) find these sheets an enjoyable challenge, and love discovering new information to help round out the Bible Story in their mind! We are so sure that you will love the Bible Story Fact Files that we are offering an unconditional 100% money-back guarantee. The Fact Files were designed for ages 6 & up. The material is equally effective with mixed age groups or single age classes. Younger children who are not yet able to read independently can be paired up or placed on teams with older children. What Bible translation should be used? Our Fact Files were designed to be used with the New International Version (NIV) of the Bible. The Fact Files can be used within minutes after purchase. The only “prep” required is printing out the fact files & finding a pencil and Bible. Were these designed for home or church use? Both! Our Fact Files printables work equally well in a large Sunday School class or a single child homeschooling setting.